Imagine having the opportunity of a lifetime on board The John Lennon Educational Tour Bus! 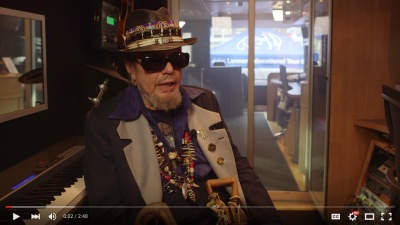 New Orleans Grammy winner / Rock and Roll Hall of Famer Dr. John invited three lucky students from Berklee City Music, A Place Called Home and the Fernando Pullum Community Arts Center to join him in tracking his song “Such A Night” on board the Lennon Bus. After an incredible day the students also had the opportunity to perform live with him during the annual Imagine Party in front of a massive crowd at The NAMM Show thanks to Juniper Networks, Securematics, Canon U.S.A., Inc., Neutrik USA, Genelec and Other World Computing (OWC).